George Frederick McKay's music emerges from the Far West of North America carrying a vigorous blend of influences, including Civil War Era folksongs sung to him by his grandparents; old Fiddlers' Tunes handed down in the family; Northwest Native American Songs and Dances, and Avant-Garde satire from the Seattle urban scene. His range of musical expression encompasses Symphonies, Chamber Works, Songs, Band Pieces, Woodwind Ensembles, Harp compositions, Organ music, Cantatas, Musical Plays, Modern Dance, and Jazzy Piano pieces. Literally hundreds of these works were published and performed worldwide during his lifetime. Much of his Jazz influenced music was composed in his younger days in Seattle. Later he studied with the Scandinavian composers Selim Palmgren and Christian Sinding at the Eastman School of Music in Rochester, New York, and was influenced toward using folk-music and evocative melodic content in his compositions. In 1923 McKay became the first graduate in Composition at Eastman. One clear memory from McKay's childhood was listening to a hometown bandstand performance by John Philip Sousa's traveling ensemble; forty years later his music was on the concert program at the Smithsonian along with Sousa's, completing a generational cycle. McKay moved on through several distinct decades of musical creativity, including many modern and historical styles in his compositions, and was a leading advocate for the performance of more American music in the concert halls of the nation. McKay's compositions were first published in Germany and France, and he joined the ranks of recognized young American Composers in 1925 when Howard Hanson conducted his prize-winning symphonic work, From the Black Hills, at the First American Composers Festival at Rochester, New York. One of Aaron Copland's early symphonic works was performed at the same concert. The performances were awarded by a panel of judges that included composers Bloch, Hanson, Goossens, and Coates. The conductor Nat Shilkret who worked extensively with George Gershwin's works on radio and in films, presented McKay's Caricature Dance Suite for Orchestra on NBC in 1929. George Frederick McKay met with Gershwin in Seattle on the night of a promotional concert by the famous New York composer. George Frederick McKay began teaching at the University of Washington in 1927 and remained as Professor of Music for 41 years. His students included Earl Robinson, who successfully composed popular hits and film scores (Ballad for Americans, The House I Live In, Black and White) recorded by such stars as Frank Sinatra and Paul Robeson. He was the first composition professor of William Bolcom, a Pulitzer Prize winner and composer of symphonies, rag-time, operas and movie scores. Goddard Lieberson, another of McKay's students was the first record producer for West Side Story and South Pacific. McKay also mentored John Cage in the late 1930's in Seattle and composed some works for The Hilarious Dance Concert, a production by Bonnie Bird and Cage at The Cornish School. The youthful dance troupe at Cornish included Merce Cunningham and McKay's daughter Georgianne. The style of McKay's modern dance music of the late 1930's era is captured in his Dance Suite No. 2, recently recorded on NAXOS Records by William Bolcom. University of Washington faculty composers Gerald Kechley and Ken Benshoof also studied with George Frederick McKay. During the period 1925-1970, George Frederick McKay's Music was presented by many leading conductors, including Sir Thomas Beecham, Leopold Stokowski, Howard Hanson, Fabien Sevitsky, Milton Katims, and Carmen Dragon. Arthur Benjamin conducted McKay's works on CBC from Vancouver, Canada. McKay's string orchestra suite Rocky Harbour and Sandy Cove is a tribute to Newfoundland folk music. McKay also conducted his own works with the Seattle Symphony for several premiere performances, and directed the CBC Orchestra and the University of Washington Symphony in various concerts. In the United States there were broadcasts of his compositions on NBC, CBS and Mutual Radio. His orchestral pieces were often performed at the National Gallery of Art (Smithsonian) in the period 1940-1965 under the direction of Dr. Richard Bales. McKay was prominent in the movement to evoke American folk-song in serious music, and spoke often with other composers on this subject. One notable and lengthy friendship and philosophical exchange was with William Grant Still, with the two composers carrying on substantive correspondence from 1937 until McKay passed away in 1970. Professor McKay also sponsored a Concert and Lecture by William Grant Still at the University of Washington in 1948. Other musical figures that McKay brought to the University to influence the academic community included Bela Bartok, Frederick Fennell, Thor Johnson, Andor Foldes, and Sir Thomas Beecham. George Frederick McKay was also a visiting professor at other major universities, including the University of Southern California on three occasions, the University of Oregon, the University of Michigan (Interlochen), and Drake University. At Interlochen in 1943 he taught with Percy Grainger and Ferde Grofe. As part of his interest in the educational world, McKay became well-known as a composer of children's pieces for piano, violin, orchestra and band. He and his wife Frances with their five children spent summers on Bainbridge Island on the beautiful blue salt-water straits across from Seattle and truly lived the Northwest life-style, and eventually the long summer days of swimming, fishing, and ferry-boat travel drifted into the professor's music. In 1940 he composed a grand Violin Concerto for the Jascha Heifetz Contest in New York. It was recently given a modern performance by Richard Hickox of London with the Seattle Symphony, and has also been recorded for release in 2005 with John McLaughlin Williams conducting the National Symphony of the Ukraine with Brian Reagin, Concertmaster of the North Carolina Symphony Orchestra as Soloist in a dynamic performance. McKay authored books concerning orchestration and harmony, and wrote many articles concerning modern music and the American scene. He published a very fine article concerning Christian Sinding's stay in America for Etude Magazine in 1944. 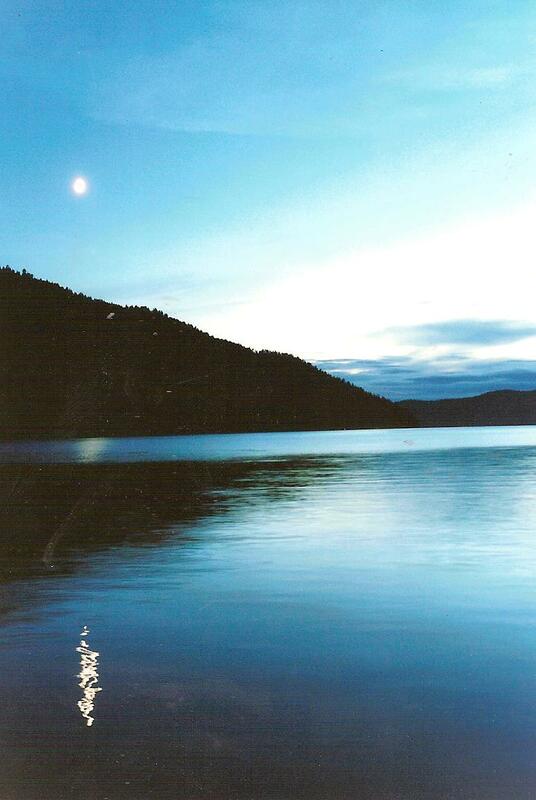 In his later years he composed many excellent chamber works such as Carson City Sonatine for Violin and Piano, that reflected his retirement in the Lake Tahoe area. He often composed music that was inspired by natural environment and he was commissioned to compose the Centennial orchestral work for the City of Seattle by the Seattle Symphony in 1952, known as the Evocation Symphony (Symphony for Seattle). McKay traveled to Japan in the late 1960's and after returning to America composed his last work, The Bears of Hokkaido, for piano, which was inspired by a Japanese souvenir woodcarving of a comical orchestra of miniature bears playing instruments, which he kept on his writing desk. 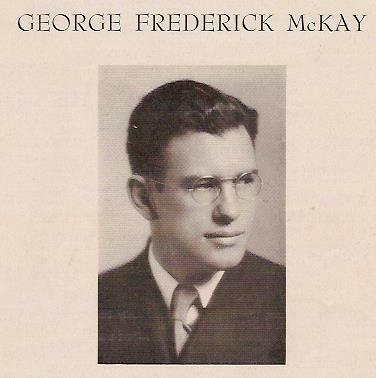 George Frederick McKay's legacy is a treasure of original musical compositions reflecting the 20th Century as well as a great number of works with important historical references to the poems and folk-songs of the American nation and the world. He is remembered by his students, friends and family as a man who loved his country, respected originality in the arts, and influenced others with kindness and a warm sense of humor. Currently his music is being broadcast over the radio waves of the world again on stations in England, Canada, France, Australia, Spain and in the United States, enriching the cultural tradition of America. MCKAY IN THE 1930's, NEAR THE TIME HE RECEIVED THE ALCHIN CHAIR OF MUSIC APPOINTMENT AT THE UNIVERSITY OF SOUTHERN CALIFORNIA, FOLLOWING SCHOENBERG AND HANSON IN THAT HONORARY TEACHING POST. Evocative scene reflecting McKay's "From A Moonlit Ceremony" premiered by Leopold Stokowski in the Hollywood Bowl during the concert series of 1946. Copyright 2015 George Frederick McKay Music. All rights reserved.